Dumpster Rental Solutions is a reliable, local, one-stop-shop for dumpster rentals in the greater Tulsa, Oklahoma, area, offering superior service and very competitive rates. We have the biggest selection of dumpster sizes anywhere in Tulsa and surrounding areas. And as a local dumpster rental company, we can offer you savings in both time and money. Tulsa, Oklahoma, homeowners rent their dumpsters from us because no matter what kind of clean-up job they have, we have the right size dumpster. Whether you’ve got a small basement cleanout project, or a multi-room remodel, we’ve got the right dumpster for the job. And because we know how important it is to protect your paved surfaces, we offer driveway-friendly rubber-wheeled trailers as an alternative to metal wheeled dumpsters. In addition, Dumpster Rental Solutions makes your life easier by offering complete junk removal services. Commercial customers like roofers, flooring companies, landscapers, builders, and general contractors rely on Dumpster Rental Solutions for even their largest jobs. So whether you’re a demolition company tearing down an office building, or a flooring company tearing out a room or two of old carpeting, we’ve got the right dumpster for your job. Choosing the right dumpster can save you a lot of time and money – and with the tight budgets and deadlines most projects involve, every penny counts. If you’re not sure of what size you need, just give us a description of the job and we’ll suggest the right dumpster. 10 Yard Dumpster – Good for small, tight spaces. We deliver this dumpster using a smaller truck and it fits very comfortably into a standard parking space. 15 Yard Dumpster – Great choice for projects where space is minimal. 20 Yard Dumpster – Outstanding choice for bigger home or commercial cleanup or demo projects. 30 Yard Dumpster – Good choice for big remodeling or construction projects, large landscaping jobs and commercial demo projects. 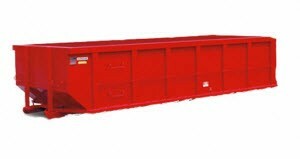 40 Yard Dumpster – Excellent for those jumbo jobs with maximum amounts of haul away and debris. Portable Toilets and Storage Containers available to rent for your convenience at any time. Full Junk Removal Service is available anytime you’d rather let someone else handle the dirty work. We provide a two-man crew to load your junk on our truck, saving you the hassle of doing it yourself. You pay only for what we remove, meaning anything but hazardous waste. Most of the material we load gets repurposed, donated, reused, or recycled – an environmentally friendly benefit of working with us.